The National Assembly held a firebrand session today in response to Thursday’s postponement of the recall referendum process against Maduro, declaring itself “in open rebellion” against the national government and calling on Venezuelans to join a series of nation-wide protests on October 26, 27 and 28. Today’s session was framed by an acknowledgement by legislators that there has been a “break in the constitutional order” in Venezuela, and that it is up to the Assembly to restore the constitutional and the rule of law in the country. The National Assembly will formally file a case before the International Criminal Court against four judges who on Thursday ruled to annul signatures collected in their respective states for the recall effort against Maduro. Consejo Nacional Electoral (CNE) president Tibisay Lucena and CNE rectors Tania D’Amelio and Socorro Hernandez will also be named in the case. The case will be centered on the accusation that the seven individuals committed crimes against humanity as per article 7.1(h) of the Rome Statute. The Nationaol Assembly will move ahead immediately with appointing new rectors to the CNE. The National Assembly claims to have irrefutable evidence showing that Maduro is a dual citizen of Colombia and Venezuela, which if true could disqualify him from holding office. That evidence was not presented at today’s assembly, but is allegedly forthcoming. The National Assembly will formally request that the National Bolivarian Armed Forces refuse to obey any orders that stand “against the constitutional principles or undermine the fundamental rights of the Venezuelan people”. 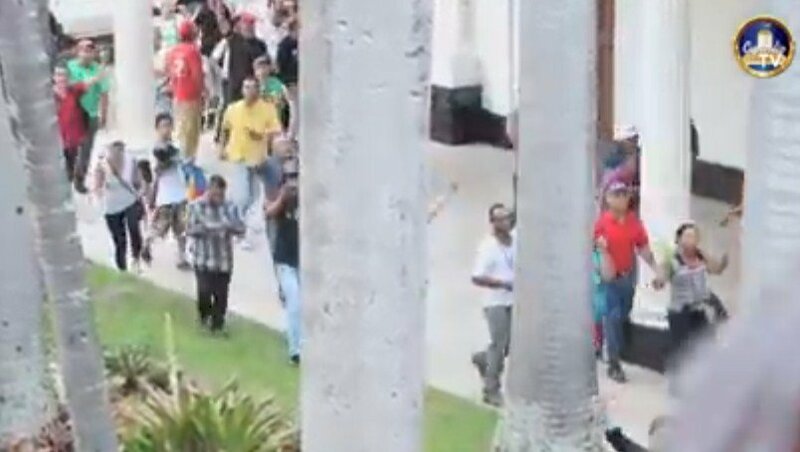 The session at the National Assembly was abruptly interrupted at approximately 1:30 PM local time as a large crowd of government supporters stormed the grounds of the national legislature and broke into the main chamber. Below, images of the storming of the National Assembly. In an interview published in El Universal today, National Assembly deputy and PSUV vice-president Diosdado Cabello said that the opposition is operating under a fatally flawed assumption: that removing Maduro from power will somehow avoid further conflict. Cabello also said that – despite public opinion polls showing that the PSUV has an approval rating of only 20% – a coalition government with the opposition is “totally impossible”. El Universal: It seems like there is nothing you can agree on to hold a dialogue? Cabello: We can’t do it. Show me a point [to agree on]. I propose one: respect for the Constitution, without any qualifications. That’s all there is. El Universal: One thing you could sit down to discuss is the economic situation, to find a solution to the scarcity and the long lines. Cabello: But what is the first thing that they’re proposing? To cut social spending. That’s not in our agenda. Fine, they should tell us what they are proposing economically so we can see it. I hope it happens. Jorge Rodriguez is recommending that the President sit down for dialogue (…) but what’s happening is that each of their proposes begins with Nicolas [Maduro] leaving. El Universal: Aren’t you concerned about the long lines and the scarcity? Cabello: Of course. If this had happened in the Fourth Republic [the time before Chavez came to power], there would be people on the street suffering a lot. But we have a government here that brings in food and medicine. During the Fourth Republic [the government] didn’t care about the people, and that’s why they had to go out and protest. El Universal: You blame everything on the “economic war”. Are you losing? Cabello: We’re not winning because it’s not over yet. It’s still happening. One thing [needed] to win it is stability in the oil prices. El Universal: Can the country survive two more years of [this] government with this level of political confrontation? Cabello: Two years, and more! Do you think that if the right-wing comes to power, political confrontation will end? That’s what they think, that they’re going to get rid of Maduro and then the confrontation will end. What do they think they’ll do with the chavistas? Will they put up with us on the streets? El Universal: Is chavismo afraid of the recall referendum because it knows that it will lose? Cabello: This isn’t about fear. It’s about the law. They must obey the law. We had elections in December. If we had broken the law, we would have come up with something to avoid holding them, because we know that the situation wasn’t the best and we [still] held elections. El Universal: Did Chavez make the right choice [in Maduro]? Cabello: I’m convinced that Maduro was the best choice at that moment. I have no doubt. National Assembly deputy Elias Jaua said today that holding a recall referendum against Maduro would be dangerous, and as a result should not be held. Jaua did not specify why he thinks the recall would be dangerous. Holding the referendum under these conditions (…) it wouldn’t have positive results for the stability and peace in Venezuela. On the contrary, it would be very dangerous. 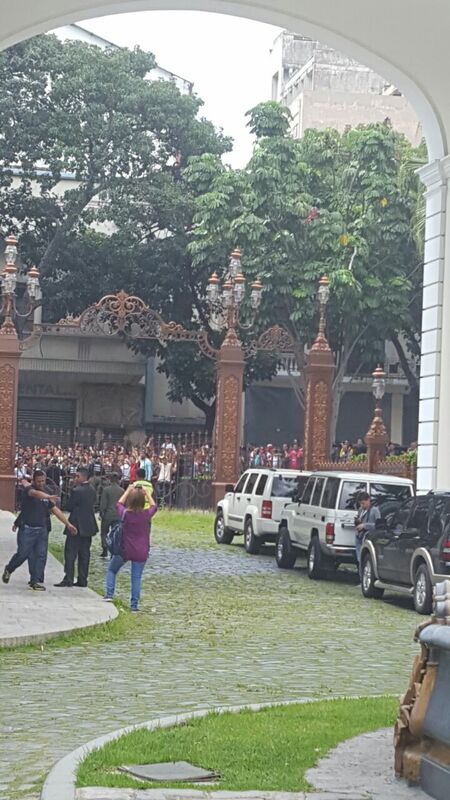 The recall referendum is a legal recourse granted to Venezuelans via Article 72 of the Constitution.